App Support: Android 4.1 and IOS 8.0 or higher Manage your home, even from afar. Control from a far The GMYLE WiFi Electrical Outlet empowers you to remotely control your appliances, whether directly with your SmartLife app (on your smartphone/tablet), or with Alexa voice control set up at home. Use it at home, from the office, or even from a cafe with Wi-Fi. Even create custom schedules so you can ditch double-checking your appliances all the time! Make your home smart at saving energy and costs Smart management actually helps eliminate excess consumption of electricity, since household devices can still eat up energy, even when not in use. Be smart about home! Save on your bill, and save valuable energy. Streamline home security Moreover, for the extended days you're away, replace old-fashioned timers that are limited in function. This smart outlet can turn on lamps on a set schedule, or at a moment's notice as you're miles away. Amazon Alexa Setup 1. Open Amazon Alexa APP on your phone; 2. Search for Skill "SmartLife" and enable; 3. Sign in to your VeSync account in Alexa; 4. Go to Alexa Smart Home section and Discover your Devices; 5. Finish. Control your devices using Alexa. Specifications: Timer Function: Can set over 30 groups of time for your appliances including schedule, action timer and countdown timer; Triggered Actions: You can set a program that it will automatically switch off the outlet if power of device reaches programmed number. This WiFi outlet configuration works on 2.4G WiFi, so please check that your phone is connected to 2.4GHz WiFi before using the app. If you encounter any problems, please feel free to contact support. 【 Timer and Schedules Function 】 - Create worry-free schedules for you lights and appliances. Using the free app, you can schedule the operating hours of your devices, schedule a lamp to turn on at sunset, or turn on the coffee pot auto every morning, keep your house comfortable by scheduling a fan to turn on at noon. Your can also create a group for all your smart devices and control them all with one command. 【 Remote Control From Everywhere 】 - Connect your smart plug to Wi-Fi to control your device from your phone or tablet via Free APP. Turn lamps, thermostats, coffee makers, fans, water heater, TVs, switches, garage doors, sprinklers and other electronics on when you get near home or off when you leave. 【 The Easiest Way to Cut Down Your Electricity Bill 】 - Keeps energy use low when you're not home to help you save more money on your electricity bill. 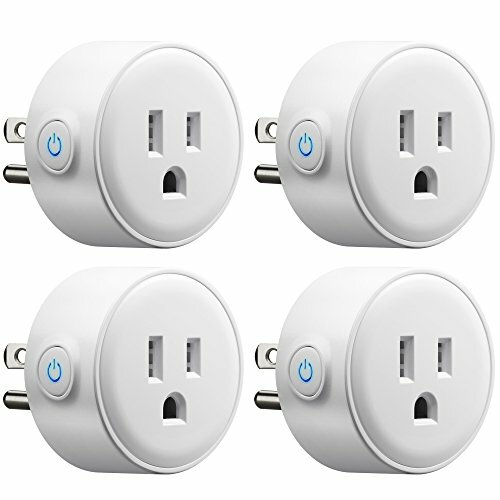 When used effectively, the smart plug may generate noticeable savings every month. You can also set up timers to automatically turn these off when they are not in use to help you save more money on your electricity bill.